Golubtsi is popular dish in many Eastern European countries and the Middle East made of cabbage leaves stuffed with a variety of ingredients. 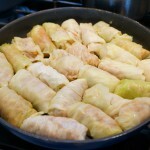 Very similar to dolma, which uses grape leaves. 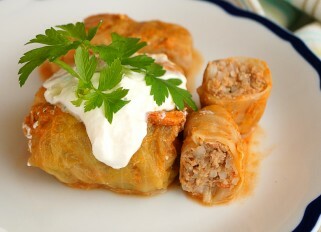 In Serbia, Slovenia, Hungary and Croatia, cabbage rolls with smoked pork are very popular at Christmas. They are cooked in a skillet or baked in the oven. 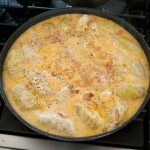 In Romania, besides Christmas and New Year, they are also common dish for weddings, baptisms and other major holidays. Romanians use grape leaves as well and in the stuffing they add smoked pork fat, sausage, ribs and certainly dill. In Sweden, cabbage rolls are eaten with boiled potatoes and lingonberry jam. 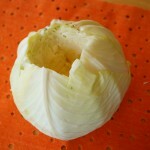 In Ukraine boiled cabbage leaves are sometimes substituted with pickled or steamed cabbage leaves. In Egypt they use fresh cabbage leaves and rarely fill with meat, instead they usually add rice and vegetables, along with different spices and herbs, such as mint or cumin. Usually my mom and grandmother cooked golubtsi with beef and rice filling, but you can add mushrooms or do a vegetable filling which is a great idea for vegetarians. Sometimes we also wrapped the stuffing in grape leaves, they are a little bit sour and have a different texture. 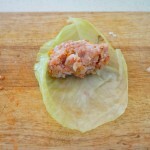 There is also ‘lazy golubtsi’ where the cabbage is chopped and put inside the meat so there is no need to wrap the filling in a cabbage leaf, just need to make meatballs. This is another dish from my childhood and a bit like Stuffed Bell Peppers with Meat and Rice I did earlier. In this recipe, I just used ground pork, but you can mix the pork and beef 1 to 1. If you have never made stuffed cabbage, then you have to try to cook them, a very simple way of cooking meat filling in cabbage leaves, and it turns out very tasty! Boil water in a deep pan. Clean the cabbage on top of dry leaves, cut the stalk and drop into boiling water. The water should cover the cabbage thoroughly. Cook for 10-15 minutes in lightly salted water. Take the cabbage, let cool, and disassemble into individual leaves. Next cut the thickened side of the leaves. I usually cut out the “v” of the heavy rib part right in the middle of each leaf. If cabbage leaves are large, then you can cut each into 2 parts. Finely chop the onion and garlic, and grate the carrots on a coarse grater. Put the tomatoes in a boiling water for 30 seconds, then peel the skin and beat in blender to puree. Finely chop the bacon. First, fry the bacon in a deep frying pan, about 3 minutes, then add the onion, garlic and carrots, stir and cook for about 5 minutes. Reduce the heat and simmer for another 5-7 min., stirring occasionally. Turn off the heat, put the vegetables and bacon into a deep bowl. Then add minced meat, tomatoes, rice, salt, pepper and stir. Mix the tomato paste, sour cream and broth (or water) in a bowl for the sauce. Put the meat filling in each cabbage leaf, fold the bottom edge over the mixture and then fold the sides over and roll into a tight packet. 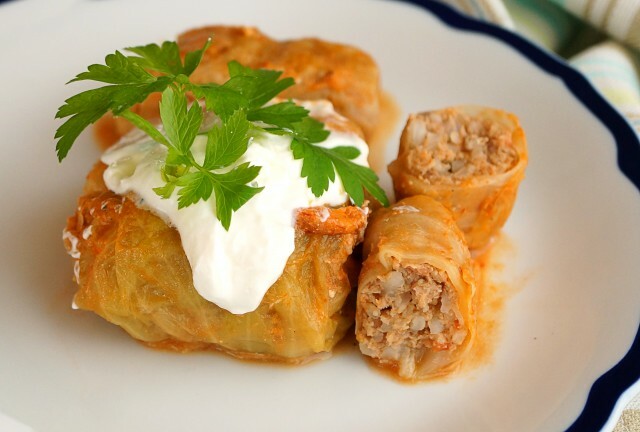 Fold the cabbage rolls in a deep frying pan, which you use for cooking the vegetables, slightly fry the stuffed cabbage in it, then pour the sauce (the sauce should barely cover the cabbage rolls), salt and pepper if necessary. Cover and simmer on low heat for 30-40 minutes. 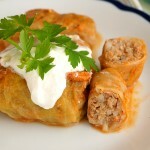 Serve cabbage rolls with the tomato sauce prepared above.